Kings square is the main town center of St. George's, and is also known as the Town Square. This is an open space and venue of many annual events and ceremonies. 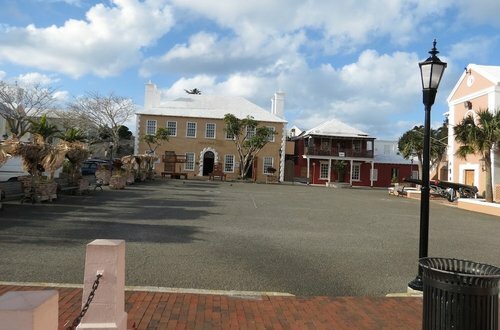 The square was created only in 19th century by filling up a marshy part of St. George's harbor. The Visitors Information Center is located at the square near the Town Hall. You can collect maps get information about the historic town of St. George, as well buy tickets for local tours. One of the prominent buildings at Kings Square is the Bank of Butterfield, which is the oldest bank in Bermuda. This building was built in 1776 and used as a mess by the troops during the American Revolution. It subsequently became a hotel and later bought out by the bank in 1950s. They have restored the building to its original design of 1776. Just outside the building, you will see replica of the Stocks and Pillory. These were used during the British colonial days of 18th century for punishing those who committed petty crimes like drunkenness. You will see the holes on the boards through which the head and the limbs were inserted and kept locked for days. Passers by pelted the punished with everything they could get hold of including rotten vegetables & fruits and even dead rats. Today it's a favorite place for tourists for taking photographs with their heads and hands inserted through the holes. You will also see whipping posts. At the eastern side of Kings square is the Town Hall which dates from 1782. It has wonderful cedar floors and ceilings. Here you can know about the past Mayors of the town of St. George and see their portraits. The civic government still meets here. At the north-west corner of Kings Square is the Bermuda National Trust Museum. The museum has exhibits and artifacts tracing the history of Bermuda including its role in American Civil War. It also has a model of George Somers's ship Sea Venture which wrecked near St. George in 1609 resulting in first settlement in the island. There is an entry ticket to the museum. 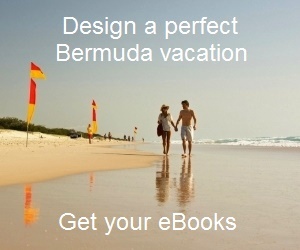 You can also buy a combination ticket that covers two other museums in Bermuda: the Verdmont Museum, and the Tucker House Museum. At the waterfront there is a replica Ducking Stool which is used to reenact the colonial history by ducking a woman into the water who plays the role of a nagging wench. This was a way of punishment used in the early days particularly for nagging and gossiping women. You will see this strange and funny demonstration overseen by the Town Crier in his colonial costume and attended by many tourists. It is staged at 12:30pm on Monday to Thursday and Saturday during May to October, and on Wednesday & Saturday at noon time in the other months. This show is free to all. St. George Market Nights take place at the King's Square. This is a weekly festive celebration with craft vendors, Gombey dancers and many other entities. It's a great tourist and local attraction and takes place every Tuesday (May - September) from 7pm to 9:30pm. X No longer scheduled. See Olde Town Market Instead. The traditional Peppercorn Ceremony is also held at Kings Square in late April. This elaborate ceremony started when the capital of Bermuda moved from St. George to Hamilton City and the old statehouse was handed over to the freemasons for a rent of just one peppercorn. From King's Square a small bridge leads to Ordnance Island used as a cruise dock. The island was so named for the guns once stored there. This place was also used to hang prisoners in early days. There are two attractions at Ordnance Island, full size replica of the ship Deliverance that was used by Somers and his men to complete their journey to Jamestown in 1610, and the Somers's own statue. While there are many restaurants in St. George's Town, there are few good ones located right at the Kings Square including White Horse Tavern and George & Dragon (closed). Many attractions are within short distances from Kings square. You can choose to walk or take a mini bus. The minibus service operates from the square and completes a full circuit covering several attractions in St. George including Unfinished church, Tobacco Bay Beach, Achilles Bay Beach, St. Catherine's Fort, Alexander Battery, Gates Fort etc and returns to the square. You can buy tickets for $6 and ride the whole day hopping on and off. Buses 1, 3, 10, 11 operate between Hamilton City and St. George's Town. The ferry terminal is a short walking distance from Kings Square. The Orange route ferry operates between Dockyard and St. George during summer.